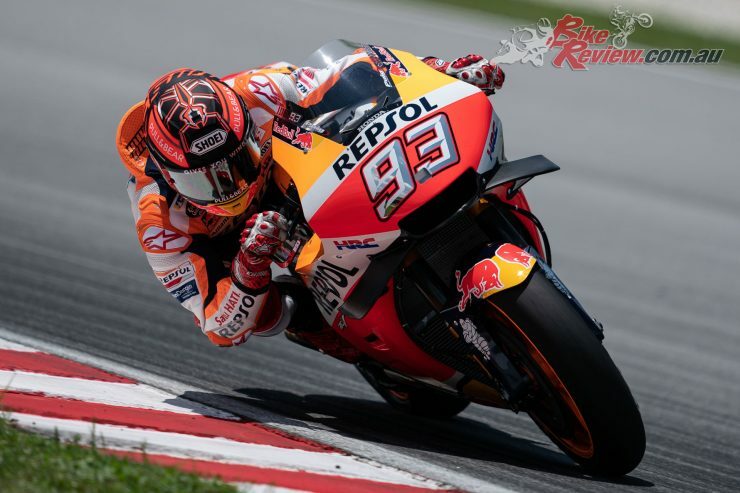 Despite recoverying from surgery on his left shoulder, Marc Marquez (Repsol Honda Team) has topped the timesheets on Day 1 at the Sepang Test with a 1:59.621, 0.259 faster than Alex Rins (Team Suzuki Ecstar) in second and 0.316 quicker than third place Maverick Viñales (Monster Energy Yamaha MotoGP) as 2019 revs back into life. 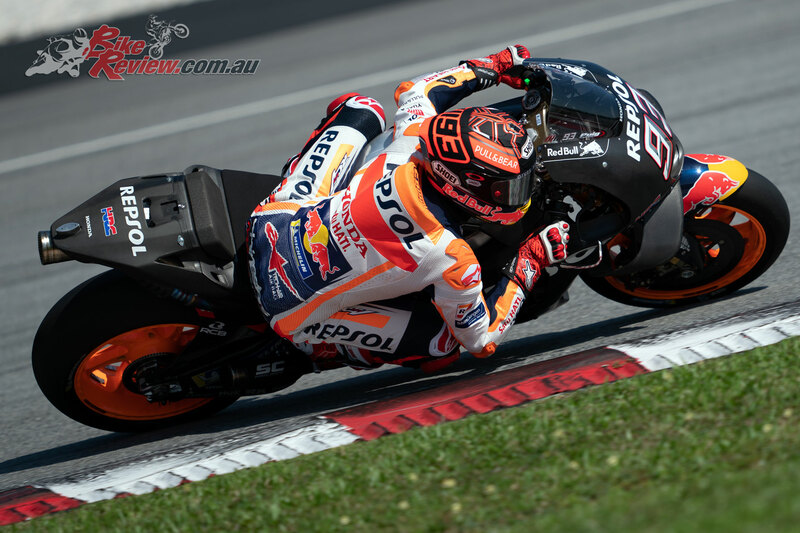 Marquez completed 29 laps on Day 1 before stopping in the early afternoon to give his left shoulder a rest ahead of the next two days, with the reigning World Champion heading for more physio in the afternoon. Teammate Jorge Lorenzo sits out the test due to injury, but there were three Hondas in the top ten as Takaaki Nakagami (LCR Honda Idemitsu), fastest in Jerez, took seventh and Stefan Bradl (Honda Test Team) ended Day 1 in P9, just under six tenths off Marquez. LCR Honda Castrol rider Cal Crutchlow, meanwhile, returned from his ankle injury sustained at Phillip Island with a solid 51 laps on Wednesday, ending his first time back on a bike in P14 with a 2:00.681. 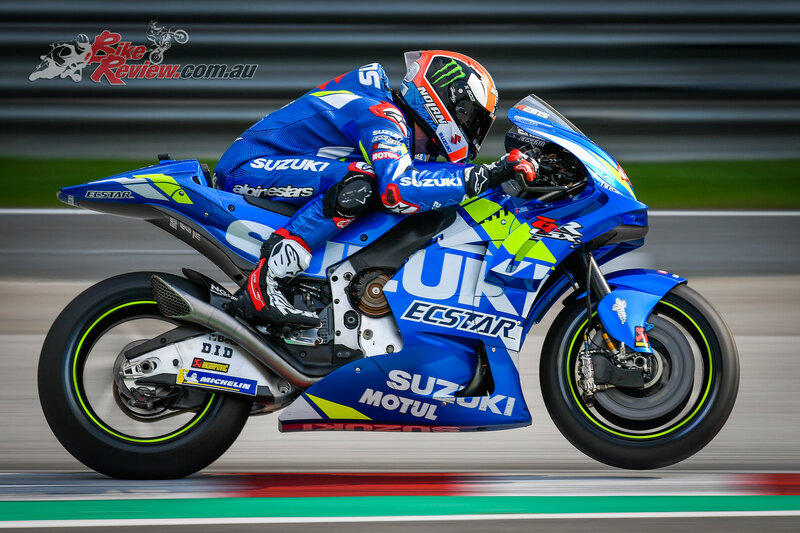 Alex Rins was one of the big headlines of the day, able to put in a substantial 61 laps on board his 2019 GSX-RR and was fastest for some time until deposed by Marquez. He remained second after his earlier fast lap, however, and was the lead Hamamatsu machine by quite a stretch. Rookie teammate Joan Mir ended the day in P23, just behind veteran French test rider Sylvain Guintoli. 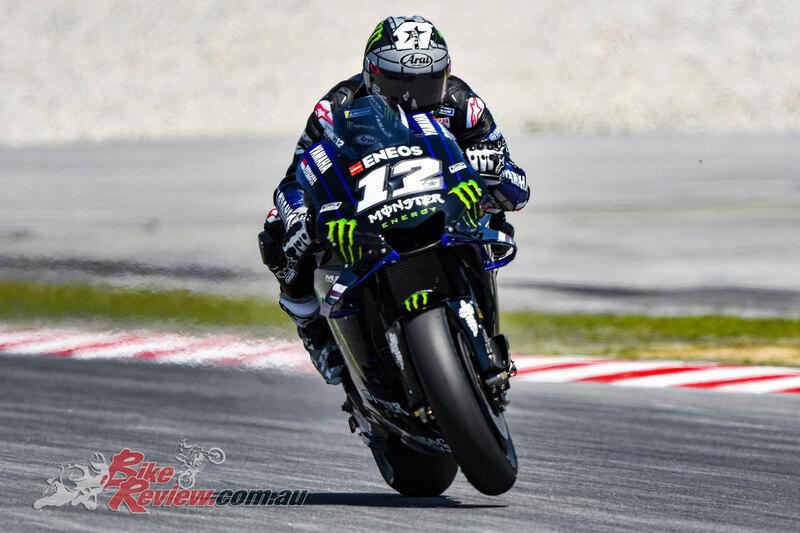 There were positive signs from Yamaha on the timesheets. 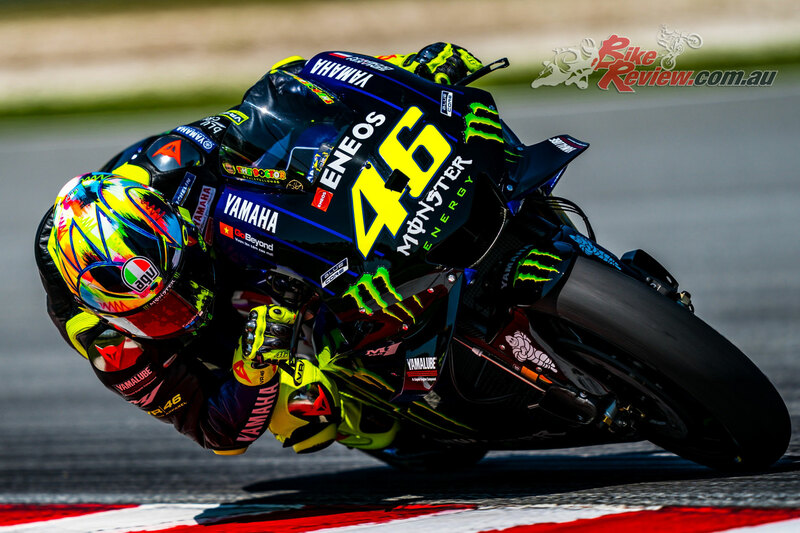 Maverick Viñales ended the day in P3 after 63 laps with a best of 1:59.937, with teammate Valentino Rossi in P6 after 56 laps and just over a tenth off Viñales. The Iwata marque are focusing on final decisions for their 2019 engine, the electronics and some chassis elements – and say comparing their times to competitors’ is a key point of interest after an intense winter of work. New team on the block Petronas Yamaha SRT, meanwhile, had Franco Morbidelli just outside the top ten in P12 after 60 laps – only eight tenths off the top – with rookie teammate Fabio Quartararo a further half a second in arrears in P18 on tight timesheets. 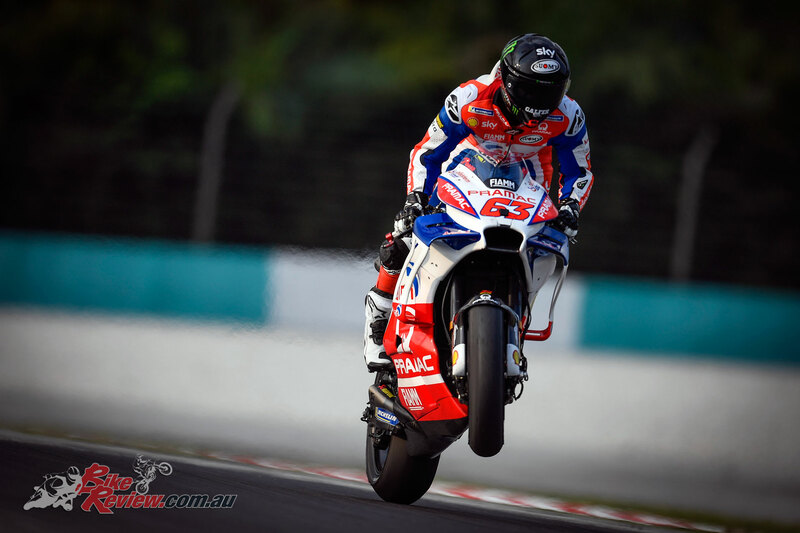 Just behind Viñales, meanwhile, was the first of the Borgo Panigale machines – but it was Reale Avintia Racing’s Tito Rabat who took that honour. 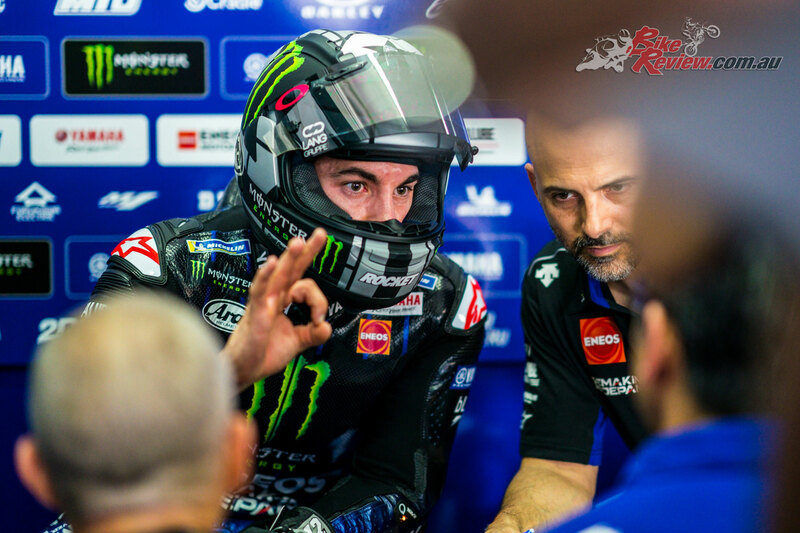 Less than half a tenth off Viñales and the last man under the two-minute barrier, the Spaniard impressed on his first day back on a MotoGP machine at fuller strength, having missed much of the latter part of last season following his crash at Silverstone. 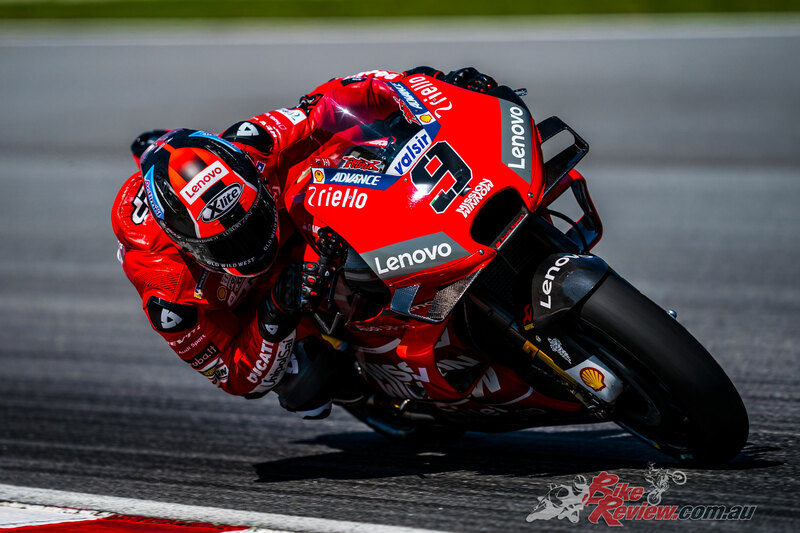 Just behind him came the first of the Mission Winnow Ducati machines in the form of new arrival Danilo Petrucci, with the Italian just 0.003 ahead of Rossi after 54 laps. 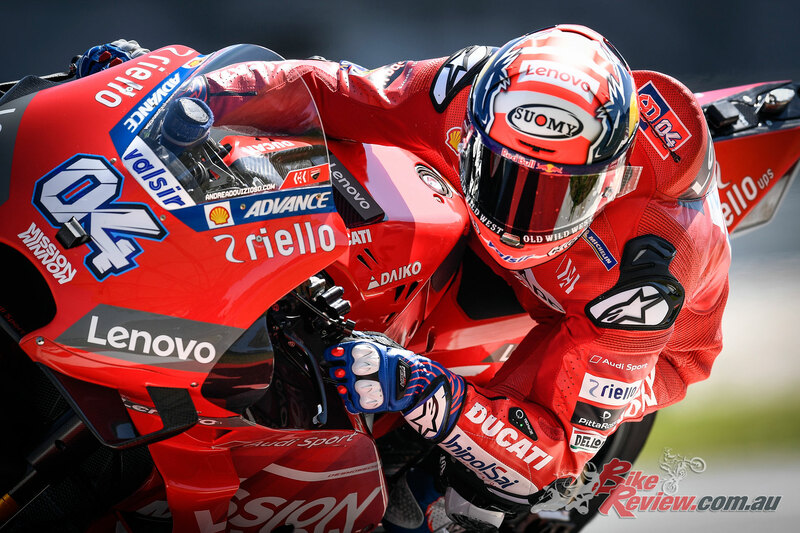 2017 and 2018 runner up Andrea Dovizioso, meanwhile, ended Day 1 of 2019 in P8 with a 2:00.197. 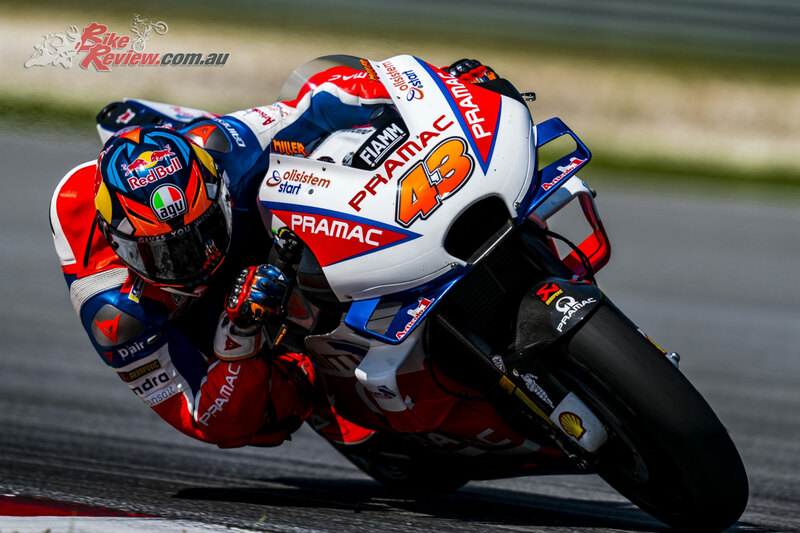 Jack Miller wasn’t far off the second factory machine despite a small crash either, with the Aussie taking P11 – three tenths off ‘DesmoDovi’ and lead Alma Pramac Racing machine. 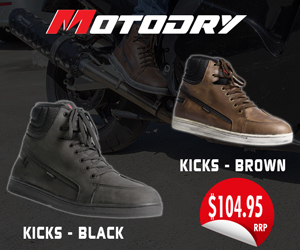 Rookie teammate Francesco Bagnaia – reigning Moto2 Champion – made for close company too, impressing in P15 as the fastest debutant. Completing the top ten was an impressive day’s work for Pol Espargaro (Red Bull KTM Factory Racing), who put in a fitting 44 laps with a best of 2:00.313 despite a crash at the end. The Spaniard took the honours of lead Austrian machine by sixth tenths, although the second KTM on the timesheets was an equally stunning performance: rookie Miguel Oliveira of Red Bull KTM Tech 3, despite a brief technical issue. The Portuguese rider finished the day in P16 and only just off fastest newcomer Bagnaia, making a big impression on Day 1 after more difficult tests at Valencia and Jerez. Experienced test rider Mika Kallio was in P19, just ahead of Espargaro’s new teammate Johann Zarco as the Frenchman continued his adaptation in P20. 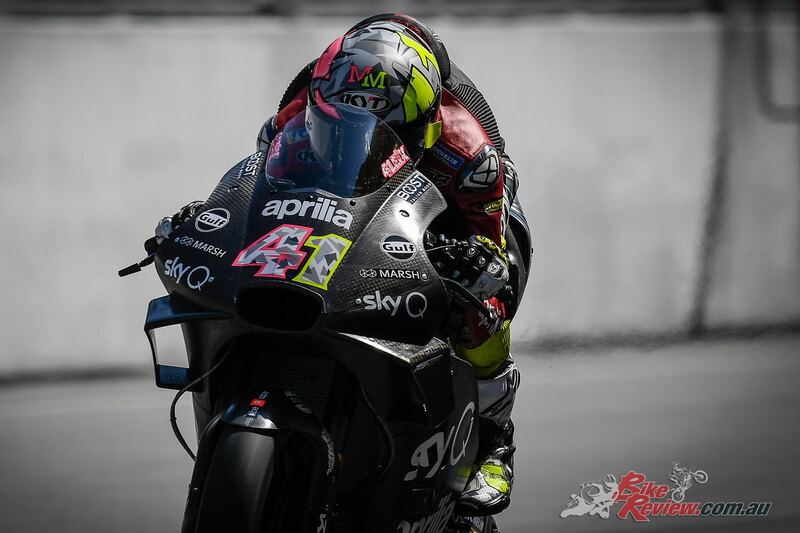 Aleix Espargaro (Aprilia Racing Team Gresini) was the fastest Noale machine in P13 and said the 2019 bike is a definite improvement, with the Spaniard putting in 55 laps to end the first day of the season just ahead of Crutchlow. New teammate Andrea Iannone was down in P21 and suffered a crash, ending the day 1.6 seconds off Marquez as he continues to get used to his new machinery. That’s it from Day 1 and somehow, it’s still that familiar number 93 at the top of the timesheets despite the reigning Champion’s surgery and tough off season. 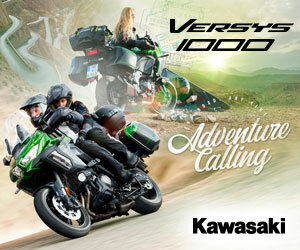 Is it a one-off? Or will he repeat it tomorrow and manage to come out swinging at full strength in Qatar, too?